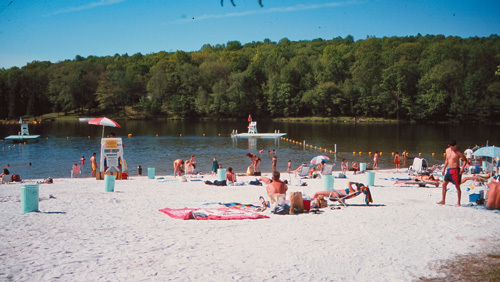 The Delaware Water Gap National Recreation Area (DWGNRA) covers a 40-mile stretch from the Delaware Water Gap to Port Jervis, NY. Interesting and scenic old roads can be found throughout the area, but none possess more mystery and legend than New Jersey’s Old Mine Road. A casual stop at the Isaac Van Campen House (or Van Campen Inn) blossoms effortlessly into a full day of exploration and discovery. The white coating on the north end of the Van Campen house end wall has been applied to show where a kitchen wing was once attached. Excursions along the road reveal layer upon layer of historical intrigue, cloaked among nature’s advancing shroud. Other roads along the way have regressed to little more than footpaths; hiking trails for those who want to explore this region that has reverted to a state more "pristine” than it was 30 years ago. The reason for this reversion is the deauthorized Tocks Island Dam project that forced most land owners in the area to sell out and move away. The resulting reservoir would have eradicated all traces from a millennium of human experience in these valleys through which the Old Mine Road travels. The stories remain for us to uncover. A glance down a lane entices our imagination; a peek up the hill rouses the explorer in us. You could spend years sorting out an endless trail of impossibly intricate clues chronicling a thousand tales along the road. Better to begin, perhaps, with some time just understanding the road’s appeal and the nature of those complexities. A good place to start? A casual stop at the Isaac Van Campen House (or Van Campen Inn) blossoms effortlessly into a full day of exploration and discovery. The Inn is among the most prominent "official” destinations along the Old Mine Road, but it is not at all apparent how many features actually wait here for discovery. Van Campen Inn sits on the unpaved portion of Old Mine Road at the lower end of Shapanack Flats directly west and over the ridge from Walpack Center. 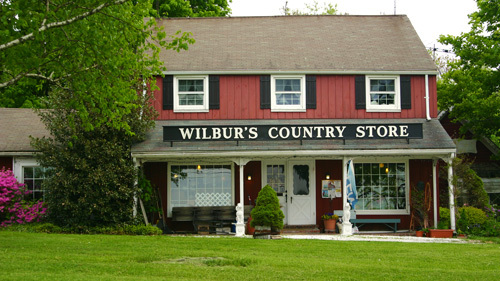 From Millbrook Village drive north to the bridge over the Big Flatbrook, turn left and follow the road along the river’s "S” curve known as Walpack Bend. At the intersection with Pompey Road, bear left onto the gravel road, crossing a small stream and continuing beside Walpack Mountain to your right. To explore the inn and the area around it, pull off Old Mine Road into the parking field across from the inn. Despite its name, the Van Campen Inn was never really used as an inn, at least not as we know them today. This "inn” was actually a "Yaugh house”, a rural house in a remote area that was required by early colonial law to provide shelter and food to travelers. The Rosenkrans family began farming in this area around 1730. After acquiring the property around 1742, Harmon Rosenkrans, son of one of these earliest Dutch immigrants, constructed the house’s first section, later called the "kitchen wing”. In 1754, Harmon sold the property and house to his brother in law, Isaac Van Campen, who probably then built the larger main house that we see today. In 1917, the kitchen wing was torn down but its outline is still visible on the end wall. There remains some disagreement, however, about which wing was actually built first and by whom. About 1811 Abraham Van Campen sold the house to Henry DeWitt of Rochester, N.Y., for his son John H. DeWitt, who then moved in. He built a "peculiar long-roofed barn” that stood, along with other outbuildings, in the grassy area across the road from the inn. The barn was destroyed by fire in 1971. Over the years the inn has suffered various problems with its structure. In the 1980s, most of the front wall and one end wall were completely dismantled, a new foundation constructed and the walls rebuilt with the original stones. 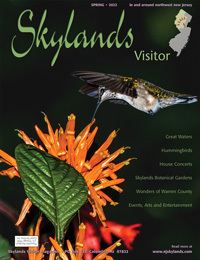 Today the Walpack Historical Society uses the inn as a museum and conducts tours on certain weekends during the year. Until the 1970s another house stood on the knoll behind the Van Campen house. In the 1700s John Rosenkrans’ home apparently stood there. In 1850 a second house, the Hull house, was built on that site, possibly using the original foundation. Some years later a third home, later called the Schnure house, replaced the Hull house. In 1755, at the beginning of the French & Indian War, Indian hostilities threatened the area’s settlers. New Jersey’s legislature responded by authorizing construction of a string of forts along its western border, roughly following the Delaware River, manned by local militias rather than British soldiers. Except for traditional local stories, very little is known about these forts. However, an existing 1750s letter and map by Jonathan Hampton indicated a fort here, by the Van Campen house. Designated "Johns” or "Fort Johns” presumably because John Rosenkrans’ house would be part of the fortification, it served as the frontier distribution point for military supplies arriving from Elizabeth Town on the nearby "Military Supply Road”. A 1756 newspaper described "Fort Johns” as the place to meet for those men wishing to enlist in the provincial army. By 1757, a county report mentioned six existing forts, and, in 1758, a militia captain headed an official letter "Headquarters, on the Frontier of New Jersey”. A plan of the fort was drawn on Hampton’s map, illustrating a stone dwelling house and two small log buildings surrounded by a 120-foot-square palisade or stockade with a blockhouse projecting outward, but showing no indication of its orientation. Known locally as Fort Shapanack, traditional accounts claimed that the fort’s stone blockhouse was on the knoll behind the inn, either beside the former farmhouse on the knoll or as part of a small cow barn overlooking the Van Campen house. In 1974, in preparation for the Tocks Island dam project, the Corps of Engineers obliterated most of the site on the knoll. In 1975, an archaeological study seemed to uncover a series of post moulds indicating a stockade, but later digs failed to uncover artifacts that would prove any 1700s activity on the site. 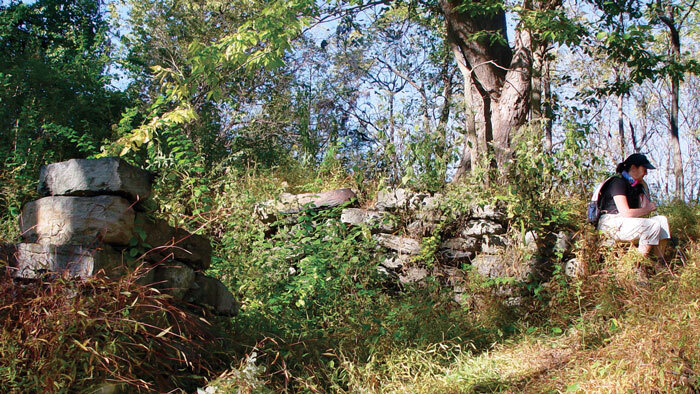 Although the house is gone, ruins of the cow barn foundation can still be seen today. There is other evidence that a headquarters fort existed at this place, but since there is no proof the fort was ever built as sketched on the map, there remains the possibility that the fort was the Van Campen house itself. Ruins of a stone foundation that once supported a cow barn might also be all that remains of a portion of Fort Johns. Wherever its exact location was, Fort Johns saw military activity in both the French & Indian and Revolutionary Wars. 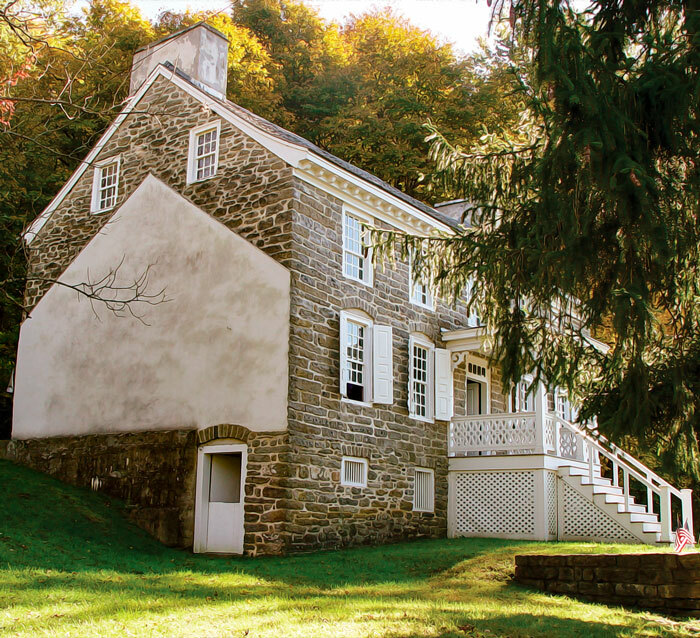 In 1763, during the French and Indian War, the Van Campen house sheltered 150 people from the threat of Indian attack. In December 1776, General Gates stayed here with his colonial troops enroute to the upcoming Battle of Trenton. In 1778 Brig. Gen. Casimir Pulaski, a Polish count assisting America in its fight for independence, brought his 250 brightly uniformed cavalrymen down the Old Mine Road and wintered here for two months. In 1779 General Edward Hand & staff and Colonel Phillip Van Cortlandt were here. John Adams, while traveling from his home in Massachusetts to attend the Continental Congress in Philadelphia, stayed here at Isaac Van Campen’s. 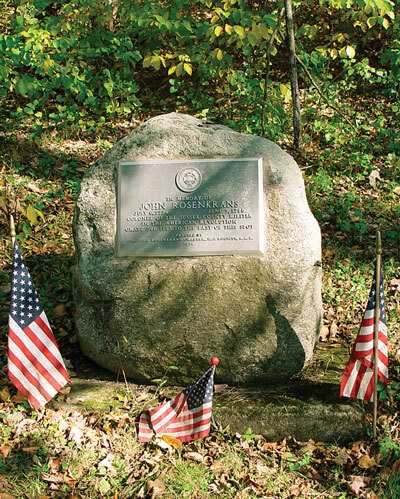 This monument for John Rosenkrans, an 18th Century “plantation” owner and militia Colonel, rests on land he donated for purposes of starting an early church and burial ground. To begin a walking tour of this area, walk northerly along Old Mine Road past the Van Campen house. About 200 yards or so from the house you will see a marker for Old Mine Road on the right and you will pass by a lane leading up the hill also to your right. 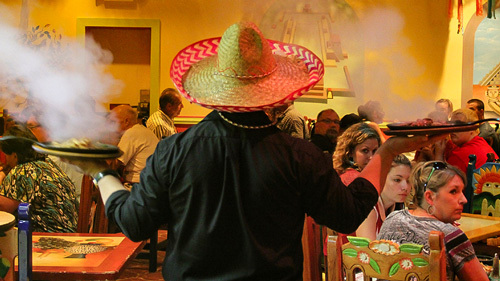 (You will return here shortly.) Continue walking another few hundred yards to the Rosenkrans monument on your right. Col. John Rosenkrans owned a large tract of land here that extended over the mountain from Walpack Center to the Delaware River. He donated a tract of land near this monument for church use. During the French and Indian War he was a captain in the local militia and was a colonel during the Revolutionary War. It was his house that was probably fortified as part of Fort Johns. Near the Rosenkrans monument is an ancient cemetery that was used for burials prior to the Revolution. Referred to as the "old Shapanack burying-ground” and the "Shapanack Dutch Reformed Church Cemetery", it consists of an upper and lower lot. An 1881 local history book, referring to a third lot, says there was an "adjoining lot that is occasionally used for the burial of colored people”. The deed for this 7.6-acre cemetery was filed in Burlington in 1754, but the property was actually conveyed in 1742. The upper lot is now commonly referred to as the Symmes Burying Ground, the lower lot is now called the Clark Burial Ground, and the third lot, which is some distance from here, has been called the Black/Slave Burial Ground. This tombstone marks the 1776 grave of Mrs. Anna Symmes, mother-in-law of U.S. President Wm. Henry Harrison and wife of locally prominent land holder, politician, & military officer John Cleves Symmes. To the left of the Rosenkrans monument is a trail leading up the knoll. Follow that to the cemetery on the top. This is the Symmes Burying Ground, best known of these old cemetery lots and containing mostly small, unmarked gravestones. Among others, members of the Rosenkrans and Van Campen families are interred here. 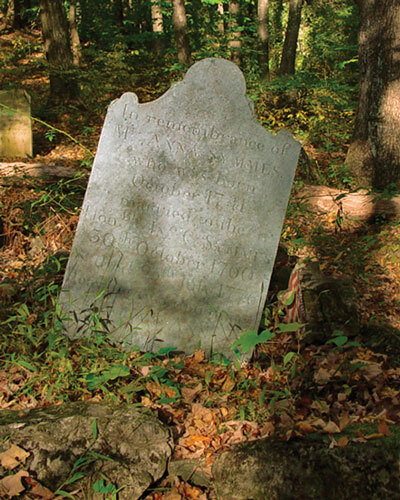 Although it is claimed there are older undated stones here, the oldest dated stone is the carefully lettered gravestone of Mrs. Anna Symmes, which has been referred to for decades. She died July 25, 1776; the same month America declared its independence from England. Her presence here is noteworthy for two reasons: she was the wife of John Cleves Symmes, a man prominent in the affairs of both this area and the state during the 1700s; and she was the mother-in-law of William Henry Harrison who married one of her two daughters prior to his presidency. Return down the knoll to the Rosenkrans monument and head back down Old Mine Road the way you came for a hundred yards or so to the small Clark cemetery on your left. This smaller burial lot is easily missed, and one wonders why it was isolated from the main cemetery on the knoll. Only a few crude fieldstone markers seem to be here, the burials being those of William Clark, some DeWitts, and Caroline Rosenkrans, ranging from 1795 to 1827. An 1881 local history book places the old Shapanack church somewhere here in the lower cemetery lot. The old church was erected before the Revolution and was built of logs in the shape of an octagon. In the early 1800s there were still large congregations attending the old Shapanack church but the organization was abandoned about 1821, part of the congregation going to the Walpack church, and part to the Peters’ Valley Church. The church was in ruins by 1881. 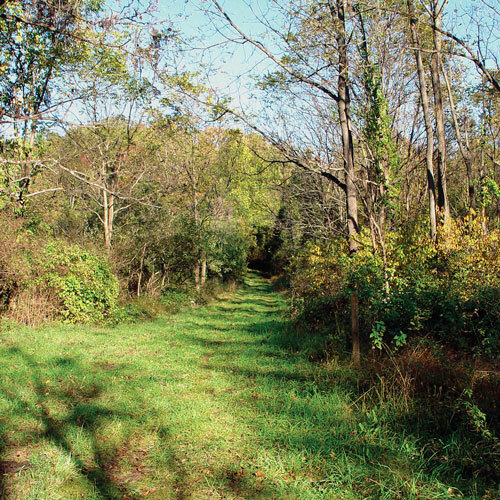 Now just a wide grassy trail leading to Walpack Center, this former road is more than 250 years old, having originally served as a colonial military supply road for forts along Old Mine Road. Continue walking back toward the Old Mine Road marker, to the lane leading up the hill on the left and then head up that lane which is now called the Military Trail. This old road was little more than a wagon trail 250 years ago when it was used as a colonial military supply route from Elizabeth Town to the Fort Johns headquarters. Eventually this old road was called Walpack Center Road and was used until it was closed in the 1960s. Now it is just a wide trail, another example of how this area is slowly reverting back to its more natural state, resembling what it must have looked like to our ancestors. Continue walking up the Military Trail a few hundred feet past the farmstead site of Rosenkrans, Hull, & Schneur; and the old stone wall on the left. The farmhouse site was on the flat area to the right and overlooked the Van Campen house below. Somewhere over there is where Fort Johns might have once stood. As the trail flattens out, about 150 yards from the beginning, stop at the two gravestones on your left. A field will be to your right. There are no bodies buried under these gravestones. Oddly, the stones were found along the river near here in the 1950s, but the location of the graves they were meant to mark is unknown. The stones were placed here because Moses Hull, one of the names on the stones, once owned this property. The accompanying stone was for his son, Victor. Various members of the Hull family owned this farm from at least the 1840s until the 1920s. Retrace your route back to the Military Trail and turn right. Walk about 150 yards toward the mountain; a meadow will be on your left. Over a small rise and near the edge of the meadow look for a low stone wall on the left about 10 yards before a steep streambed. Follow the path about 60 yards into the woods where it will turn right and head up a low flat-topped rise. Look for low, unmarked stones placed on edge in the ground, indicating the third cemetery lot referred to earlier as a "Slave/Black cemetery”, about 600 yards across the fields from the old Shapanack cemetery. A Park Service brochure refers to this "slave cemetery” along the Military Trail but states that additional research is necessary to substantiate this claim. Possibly buried here are slaves and later free African Americans. The burial of an African American woman was witnessed here in the 1890s by a white diarist. John Rosenkrans’ 1773 tax records show he owned a slave. Van Campen farm owners Isaac and the DeWitts also had slaves, so it makes sense that this cemetery might have been used for slave burials. Since New Jersey abolished slavery in 1846, freeing any remaining slaves, it is more than likely that freed African Americans who stayed in the area could also be buried here. It is claimed that somewhere deep in the woods across the trail from the cemetery are the ruins of a cabin that might have been used by a few slaves. Whether these were still slaves or freed people is uncertain. Very likely there were African Americans living around here long after the slaves were freed by law. 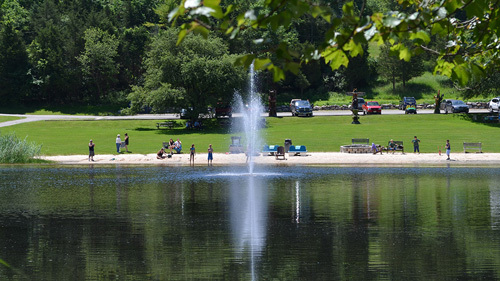 At this point you can continue hiking another mile over the mountain to Walpack Center or return to your vehicle to continue along the ever-fascinating Old Mine Road.